There are two types of Sets in the System.Collections.Generic namespace: SortedSet and HashSet. Both of them offer the functionality of storing non-duplicate items. The main difference between them is the fact that the SortedSet obviously has its items sorted. Therefor, if you do not care about the order in which the items are stored, you are better off performance-wise to use a HashSet. It will be slightly faster. In comparison with a List, a HashSet has a bit slower adding of elements. However, searching, reading or deleting elements is much, much faster, due to the hashing of the elements. HashSet doesn’t have a capacity set. Its capacity increases along with the addition of elements. 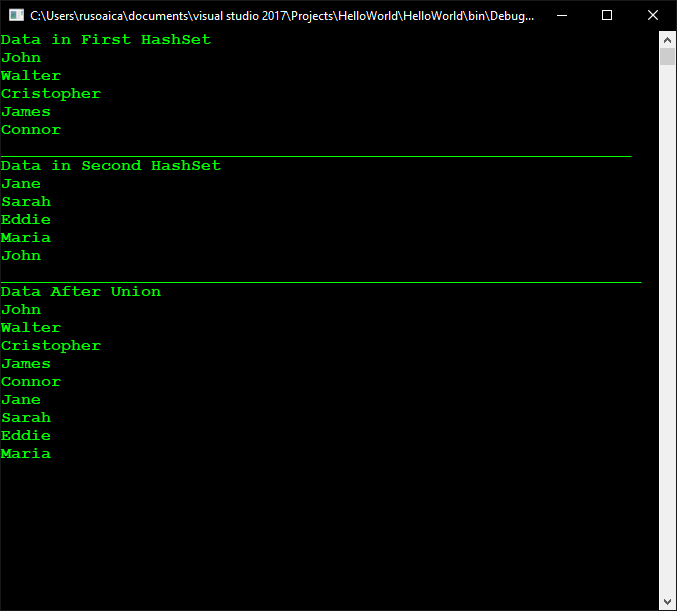 UnionWith() – we can use this method to union (join) the elements already contained in a HashSet with the elements of another collection. Notice that the duplicate elements were removed from the merged HashSet. ExceptWith() – This method is the complementary of UnionWith() – it will remove all the elements that are contained in both data structures, including the duplicate elements. SymmetricExceptWith() – This modifies the final HashSet to include only the results that are present in one of the HashSet, but not both. All the matching elements will be removed. 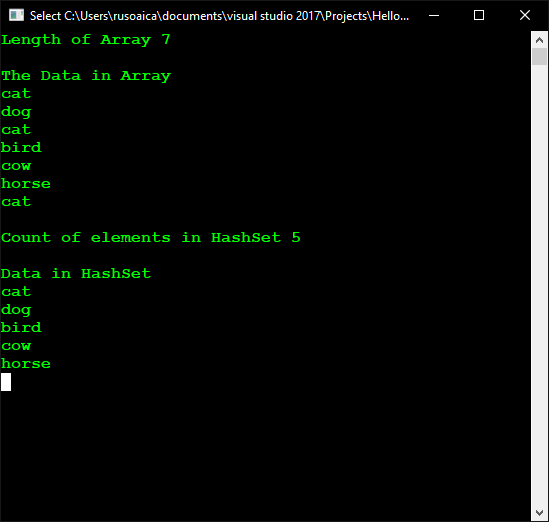 Count – returns an integer representing the total number of elements in the HashSet. This entry was posted on Thursday, June 14th, 2018 at 20:58 and is filed under Data Structures. You can follow any responses to this entry through the RSS 2.0 feed. You can skip to the end and leave a response. Pinging is currently not allowed. Posts (RSS) and Comments (RSS). 508 interogations. 0.408 seconds.